Data Visualisation: How are people switching between networks? Ken’s Tech Tips graphically visualises how UK punters have been switching network and finds out who the winners and the losers are. In this study, Ken’s Tech Tips polled more than 6,000 people over a 2 month period to find out how they’re switching mobile network. We’ve visualised this data to look at the net movement of customers from network to network. Our graphs show which networks are losing customers, which networks are gaining customers and where the customers are coming from. For this visualisation, we polled 6,145 people through our PAC Code Finder tool between October 20th 2010 and December 19th 2010 (the same data set used in our “Ken’s Tech Tips Index” study of network performance). Respondents were asked to “select your current network provider and the network that you wish to move to” from a drop down menu of 9 mobile networks: 3 (Three), O2, Orange, T-Mobile, Vodafone, ASDA Mobile, Giffgaff, Tesco Mobile and Virgin Mobile. These 9 networks form our study. From the 9 networks, we took each pair of networks in turn. 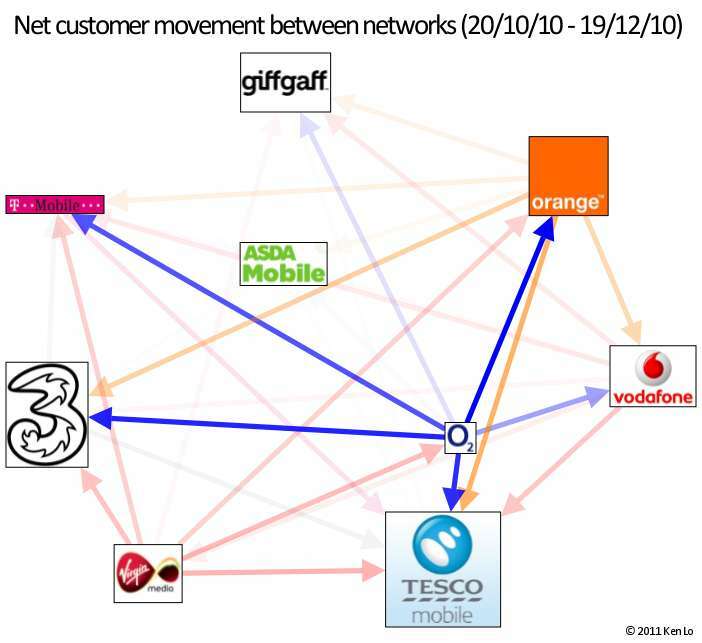 We looked at the “net movement” of customers between each pair of networks and have visualised it in the graph below. For example, if 200 customers switch from Network A to Network B and 100 customers switch from Network B to Network A, the “net movement” of customers would be 100 customers from Network A to Network B. This would be represented by a line pointing from Network A to Network B in our visualisation. The direction of the arrow represents the direction of the net movement of customers. The opacity of the line represents the size of that net movement (e.g. the darker the line, the larger the net movement of customers in that direction). The size of each network’s logo depends on how many customers they are gaining or losing. If a network is gaining a lot more customers than it is losing, it will have a larger logo. If a network is losing a lot more customers than it is gaining, it will have a smaller logo. There is a significant movement of customers away from O2. One thing which instantly stood out in the graph was the large net movement of customers away from O2. At first, we thought this may have been due to a larger than expected number of O2 customers using our tool to switch away from O2. This would have skewed the results of our study to show a large number of users moving from O2 to other networks. However, a detailed analysis of the statistics showed that 28.1% of respondents were existing O2 customers moving to a different network… pretty much what would be expected given O2’s market share of 28%. We conclude there is no over-representation of customers moving away from O2 in our results and the net movement of customers away from O2 must be due their inability to attract customers from other networks. O2, Virgin Mobile and Orange are losing customers overall. Amongst the respondents to our study, there is a clear movement of customers away from both O2 and Virgin Mobile. This can also be seen in the low scores both networks experienced in our latest “Ken’s Tech Tips Index” study. For Orange, there is a slight loss of customers overall but this is less obvious from the visualisation. Tesco are gaining customers from all of the major networks. 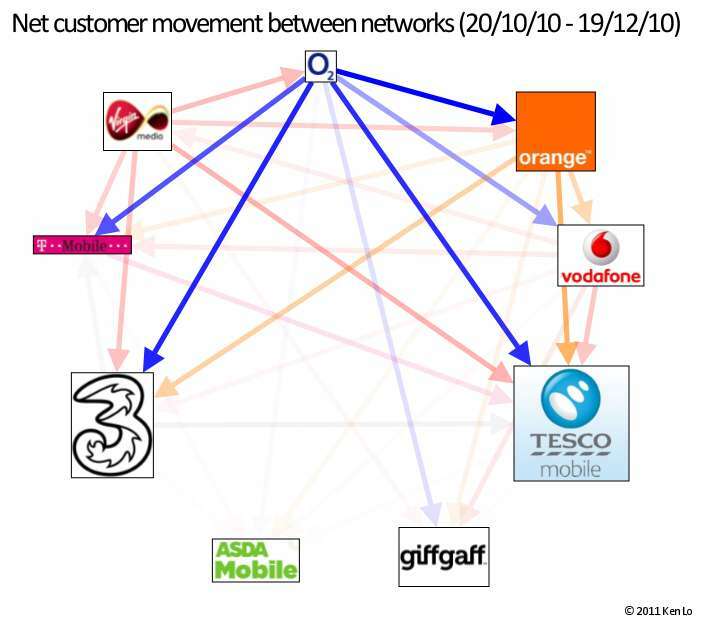 In our visualisation, we see a movement of customers from all networks towards Tesco Mobile. Tesco have had the most success in gaining customers at the expense of O2, Orange and Vodafone. There is a very small net movement of customers from Three and T-Mobile towards Tesco Mobile but this barely registers on our visualisation. Three are gaining a lot of customers too. Three appear to have had managed to woo a lot of ex-O2, ex-Orange customers and to a smaller extent ex-Virgin customers. Three haven’t had as much success gaining customers from Vodafone and T-Mobile though. 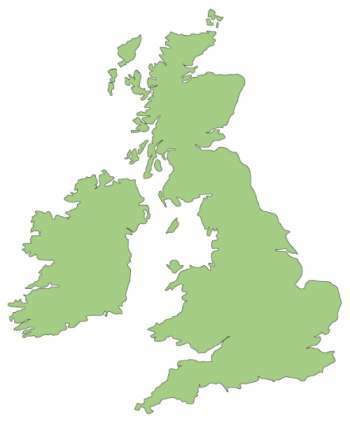 Giffgaff and ASDA Mobile still barely register on the map. In our visualisation, there is very little net movement of customers towards either ASDA Mobile or Giffgaff. In fact, the number of customers choosing to switch to ASDA or Giffgaff is a tiny fraction of the number of customers switching amongst the larger networks. Some of these trends become clearer to see when we rearrange the icons in our visualisation. In the rearranged visualisation (below), there is a “net movement” of customers down the graph. Three and Tesco are the big beneficiaries here with low-cost networks ASDA and Giffgaff still failing to make a big impact. Our study measures intention to switch and not whether customers actually go ahead and make that switch. However, we expect this data to be strongly correlated. Our study also fails to consider customers who may switch network but decide not to switch number (customers who don’t use a PAC Code). Our study also does not consider mobile broadband and tablet tariffs (for which a PAC Code is not required to switch). This study considers people who switch network and port phone numbers between October 20th and December 19th. Many Pay As You Go phones purchased before Christmas are likely to have been purchased as gifts and will be activated on or after Christmas Day. We would not see the activity from these phones in this study. The sample size is n=6145 users of the PAC Code Finder tool. We have only analysed data in aggregate form and no personal details are collated during this study. Please see the “Ken’s Tech Tips Index” study for related research. Please contact Ken if you have any further questions on the study or to request an information pack detailing the study. We'd love to hear your thoughts and any questions you may have. So far, we've received 1 comment from readers. You can add your own comment here. I am moving from 3 which I had joined for an excellent value SIM only package. This year in the two places I most commonly wanted to use my phone I had a poor signal in one, such that I could not walk around the flat in Cardiff when on the phone, and a practically non-existent one in the other, such that I could rarely send or receive texts indoors and had to walk a good distance from the house to hold a phone conversation. My home is not in the wilds; its in a well-populated part of Macclesfield, not that far from the centre. All other networks seem to have better coverage in these two places. When I requested my PAC code from 3 the man kept trying to persuade me to stay with the network!